Currently viewing the tag: "Conference"
Wow, how time flies! It’s only just over two weeks away from the start of RTC Australasia. 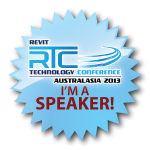 Earlybird Registration for the ninth Australasian Revit Technology Conference opened today. This year the conference is being held at The Langham Hotel Auckland, New Zealand, Thursday, 16 May – Saturday, 18 May.